Submitted by Rashkavar on October 31, 2016 - 4:51am. But I like drinking ethanol! Granted, I generally don't drink it straight, but there's so many interesting flavors of it available. Methanol, Propanol, etc are the ones you don't want. Ethanol you just don't want too much of in a sitting. Submitted by Jam on October 31, 2016 - 9:09am. I mean... you gotta live your truth but my advice is to find other means of dealing with climate change!! Submitted by soultrain on October 31, 2016 - 11:01am. 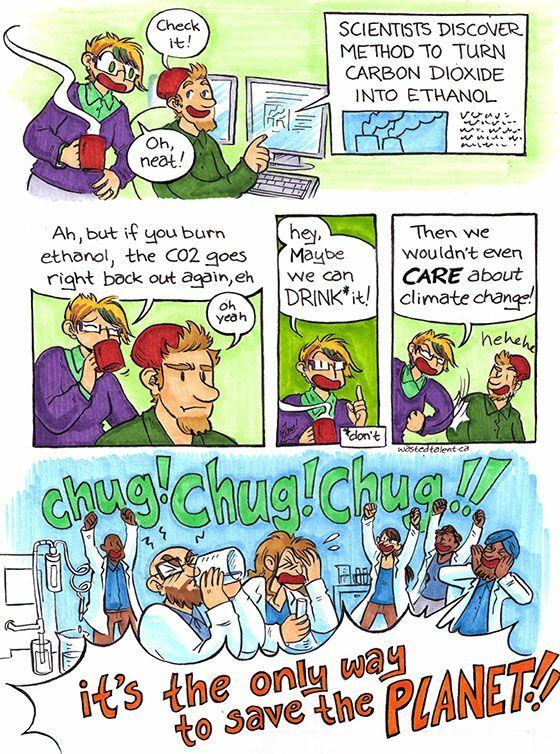 If you can turn CO2 to ethanol it at least makes fuels carbon-neutral. Submitted by Mike Garrison on October 31, 2016 - 9:18pm. Not likely. It takes energy to turn CO2 into ethanol. That energy has to come from somewhere. Submitted by Antonyious on November 10, 2016 - 10:06pm. Hey, I'm not against that. More ethanol for us.